This week has been very exciting in Reception and Key Stage 1. 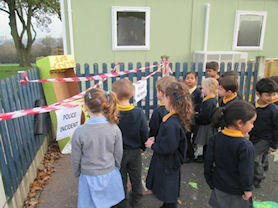 The children arrived in school on Monday to discover a strange crime scene in the Reception playground. 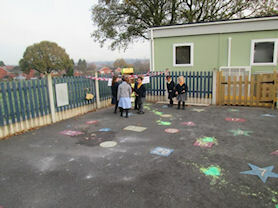 A space ship had crash landed and leading into the classroom there were large, slimy footprints. 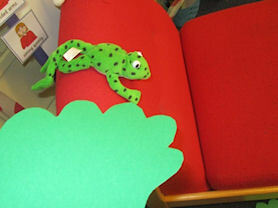 In the classroom there was a note explaining that Fred had been taken. All the children set out to investigate what could have happened and look for clues. They created wanted posters of the alien and space rockets to find Fred. 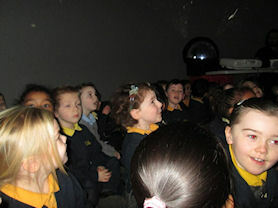 Even more exciting, the children in Reception and KS1 got to visit space. A large planetarium came to the hall and showed the children the stars, moon and lots of fantastic planets. In the afternoon we even had a visit by the alien that had taken Fred. It looked green and friendly and not very scary. The alien left Fred and flew away in its rocket. 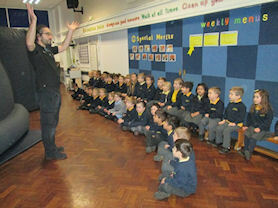 It was a brilliant day and all the children were enthusiastic to find out more about space. Some children would even like the alien to come back and visit again.